Who am I? I’m Jim, and I’ve been living with BW for 20 years! I first began working with SAP BW in 1998. At that time, I worked as part of a team delivering reporting solutions that would enable our business to work flexibly with Customer and Profitability data sourced from SAP R/3. BW was effectively replacing a solution I had proudly built with Microsoft SQL and Cognos reporting applications. Although I appreciated and understood the architectural decision of the company to adopt the benefits of SAP integration, I was heartbroken at having to wave goodbye to my SQL-Cognos baby. I found the swap of SQL freedom to the controlled and initially confusing configuration options inside a BW 2.0b app a very bitter pill to swallow! However, with good training and a strong desire to understand the inner guts of the BW apps, I was soon a convert. With BW, I had an object-based application that would help materialize a standard, pattern based Data Warehouse; supported with all the data extraction, query and reporting apps we needed to give us an end-to-end Business Intelligence platform, and critically a platform that could efficiently make sense of the thousands of underlying tables and “sophisticated” relationships in the R/3 database! Since then, SAP’s relentless investment in BW has consistently improved the usability of existing functions and brought new capabilities that build on the core concepts established in the early releases. Any BW developer will therefore know that the question of the next upgrade is something that is never far away in their thoughts. You can read more about the upgrading to a modern data warehouse here. 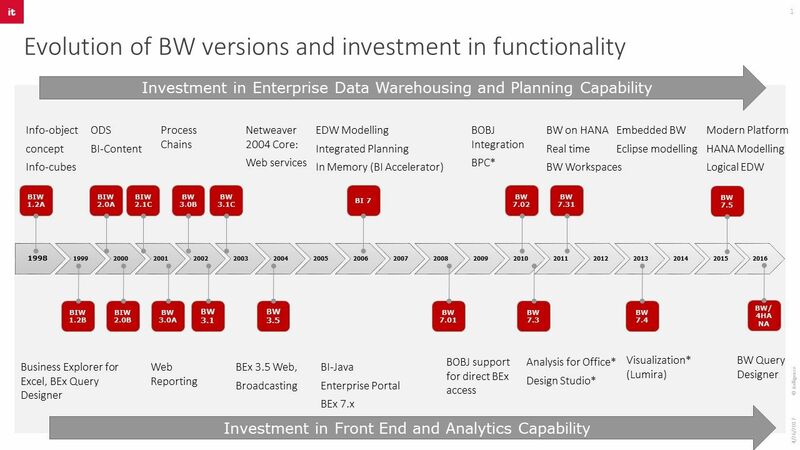 What’s exciting about the upgrade timeline above, is that it is the here and now and the latest incarnation, SAP BW/4HANA, that presents the most dramatic step change in the world of BW as we know it. In the same vein of S/4HANA, some of the earliest foundations of the application are being radically ripped out in favor of a simplified suite of modern data platform capabilities that will enable BW to be reborn and live on in the new data driven future. For example, no more will we build data models in the classic SAP GUI, no more will we deliver Business Explorer content – and with the right approach, no more will we be frustrated by the restrictions of data modelling solely based on the features available in the BW apps. In my opinion, this is the greatest benefit of SAP BW/4HANA: the capability to tap into the powerful in-memory SQL based modelling functions available with HANA Studio. In SAP BW/4HANA, BW Object data models can be consumed in the HANA SQL modelling space and vice-versa, side by side in the same Eclipse development environment. It is true that this capability has been evolving since the first versions of SAP BW on HANA, but with BW4’s Eclipse based data flow modeller the concept of a fully merged development environment supporting BW content and SQL based extensions is realized. So, for those coming to BW for the first time, developers should find their experience far less jarring than the challenges I faced as a SQL head being plunged into BW in 1998. In fact, with the premium application management and maintenance features offered by SAP BW/4HANA, data modelling analysts and specialists from any technical background should appreciate the strength and completeness of functionality SAP BW/4 HANA offers. How do we get there if you already run BW apps? Migration to SAP BW/4 HANA needs to be approached with the same level of due diligence that any customer would introduce when upgrading systems. Essentially, we have two options available that should be considered as part of any initial analysis. In terms of the journey to SAP BW/4HANA, the upgrade of an existing BW implementation is something that needs to be carefully considered. In one sense, the upgrade approach is based on the same path of generic activities we undertake with any upgrade. 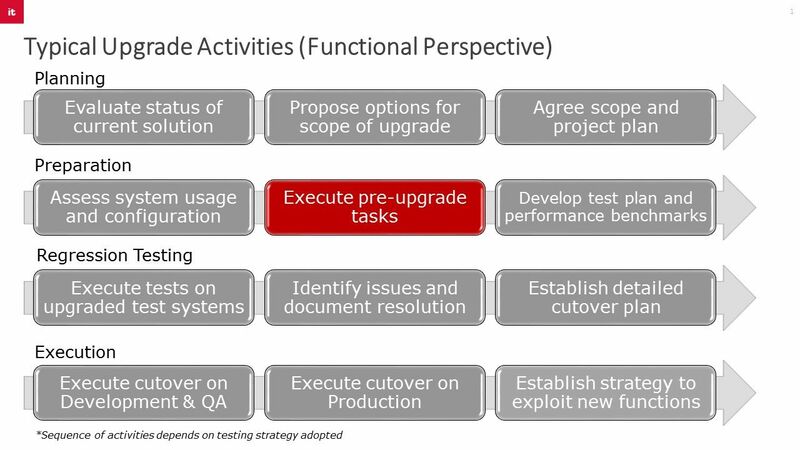 However, this time there should be far more focus on the step highlighted below “Execute pre-upgrade tasks”. As SAP BW/4HANA radically digs out and replaces some of the classic core object types, pre-upgrade execution tasks are more involved. SAP BW/4HANA only supports the objects introduced with the more recent versions of BW running on a HANA Database e.g. Advanced Data Stores and Composite Providers. Therefore, in preparation for the upgrade, we need to ensure that all deprecated object types are converted to their new equivalent before the upgrade can proceed and complete. Arriving at the point where we can perform that conversion will involve an interim upgrade to SAP BW 7.5 on HANA (SP4) – unless you are already there. This two-step process and the timing of activities is something that should be carefully planned, and will of course depend on the complexity and criticality of the BW solution being addressed. The alternative is to consider a new installation of SAP BW/4HANA, and take the opportunity to re-implement your existing BW based solutions (and maybe some new ones) on a fresh platform that will replace your legacy BW implementation. The benefit here is that you are able to develop your new SAP BW/4HANA apps and implement without disruption to your current operational services. To learn more, listen to our on-demand webinar on BW/4HANA to learn what’s new in BW/4HANA and what the migration paths are. This recording covers the biggest changes for customers considering moving to BW/4HANA as well as the new features and functionality. Or download the white paper to learn more about this next generation data warehouse. At itelligence we have experienced consultants who can support customers with migration of SAP BW to SAP BW/4 HANA following our standard methodology. This methodology also takes in to account the customer roadmap of their ERP to S/4 HANA where required. Please contact itelligence to find out more about our migration assessment offers. Jim is an SAP certified Principal BW/HANA Consultant and Chartered Management Accountant with over 18 years solution design experience gained while working for global end user and consulting organizations. As the itelligence Analytics Competency Lead for SAP Customers, Jim designs and delivers solutions that help clients drive insight from their data using SAP BW, HANA and BI technologies. He has solution experience covering a broad range of industries, including Professional Services, Food and Beverage, Retail, Manufacturing and Finance.